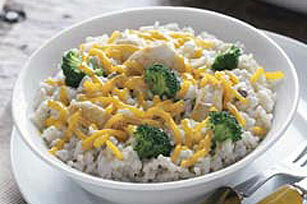 No doubt about it—this easy chicken and rice dish is comfort food in a bowl. Dish out this hearty entrée to your family for a warm end to a cold day. Spray nonstick skillet with cooking spray. Add chicken; cover. Cook 5 min. or until cooked through. Sprinkle with garlic powder. Add soup and milk. Bring to boil. Stir in rice and broccoli; cover. Reduce heat to low; simmer 5 min. or until rice is tender. Stir in 1/2 cup of the cheese; sprinkle with remaining cheese. You can always substitute other fresh vegetables you have on hand for the broccoli, such as thinly sliced peppers or sugar snap peas. If you're reheating leftovers the next day, stir in a little milk first to keep it creamy.